The new year is here, ok I know it’s already 6 weeks in, but let’s pretend we’re back in January for a little bit. January is typically the time of year I spend taking down the Christmas decor, cleaning out closets and working on updating business information. This year I spent it dealing with sick children and being sick myself for an entire week. Not how I had hoped to kick off the new year. The good news is everyone (knock on wood) is feeling better and while the Christmas decor is still littering my basement waiting to be sorted and put away my business information is coming together nicely. I’ve created an all new website, working on updating the blog and am working on putting all of my pricing and products together in a fabulous (if I do say so myself) new pricing guide. I think being able to see everything that is offered and the options available to you will help aid in your decision making on which images, what sizes and the age old question “what do we buy for grandma”. You will notice there are some minor changes to the session options, the print collections and the digital offerings. I’ve spent countless hours reworking on the print and digital collections to better suit my clients, I hope you’ll see there is something for everyone. The pricing guide will be finished by the end of next week, whoo hooo! It’s been a lot of work but it will all be worth it. Another new option is being able to choose the session that suits you right from the website, add it to your cart and check out. I’m still working on the payment process, but for now it is a really easy way to choose your session. 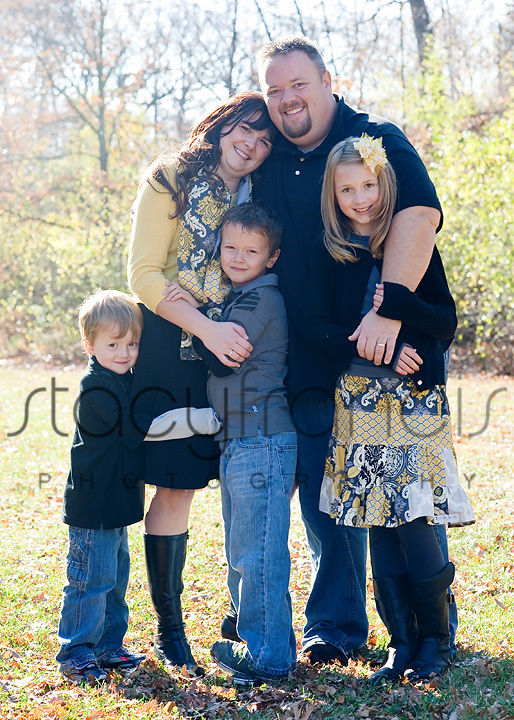 Here’s a little known secret, taking family portraits, not my favorite thing to do. There, the cat’s out of the bag. I love newborns and 6 month sessions, 3 year olds, could eat them up, but when I get an inquiry for family portraits I get a little knot in my stomach. Here’s why, typically there is one parent that really wants that “perfect” family portrait, (see post below), they’re anxious over how everyone looks and spends more time watching the kids than they do me, therefore I end up with a lot of pictures of mom or dad looking at the kids than at me, making that “perfect” family portrait not so perfect. Kids who are typically happy go lucky kids are not so happy to be there because they can sense the stress, all the way around they’re just not my favorite. But, yup there it is, don’t kid yourself, you knew it was coming… then along comes a family like this one, they had some wardrobe malfunctions (forgotten shoes), it was cold out (I think I complained more than they did) and in the middle of it my camera decided to take a break (I had a back-up, but ended up not needing to use it, thank goodness). Even with all of that, mom was calm and collected, dad laughed through the entire thing and the kidlets, while cold, put on their happy faces and showed why they’re such a great family. They didn’t give me a funny look when I asked them to “just hang out”, giving me the chance to capture them as they are, relaxed, slightly goofy and very loving. We hit two locations in less than an hour and have oodles of wonderful images. I get some really fun, amazing families through the studio, they’re helping to make that knot slowly disappear, this family makes my heart sing. Nope, not the holidays or cold weather, I’m talking about the holiday card session… Ok, so this holds true for almost any session, but seeing I just did the pictures of my kids for our Christmas card yesterday afternoon holiday card sessions are at the top of my mind. You know how it goes, the stress of coordinating outfits, making sure each hair is as much in place as possible, stressing about every little thing. I know what it’s like when you walk through the door for your session, I’ve been there. I get a little shorter with my kids when they’re running around in their perfectly clean and wrinkle free clothing. The thing is I know better, I see it all the time, stressed parents equals stressed kids and forced faces, why do we do this to ourselves and why must it be stressful? I always tell my clients to not stress about things, we’re here to have fun and enjoy the time together, relax and let things unfold naturally, I promise I’ll get the shots that look the most like you, not this posed, smiling at the camera family that seems unnatural and stiff. And yet when I take the yearly holiday card photos I end up being that mom, the one that makes her kids sit and look all pretty. I think when they were younger it was harder on me because they wouldn’t look all pretty for the camera, and yet those are the images I cherish most, so why now do I ask them to look all pretty for the camera? Maybe it’s because they’re at that age where I’m not really sure how to get them to interact with each other naturally, they’re aware of the camera and at any given time at least one of them is trying to pose, or they’re busy poking and annoying one another. Sooo… here’s what I’ve learned from my own session with my children. I can tell you not to stress, but there’s a chance you will anyway. Know that while everyone looking at the camera all pretty and sweet is what most people think they should have, seeing a family interacting and enjoying one another is much more pleasing and natural, unless of course you tend to sit around all posed, pretty and smiling on a regular basis 🙂 Take a deep breath when we start the session and know that I’m going to work hard to capture amazing portraits of your family, the family life you live, on a daily basis. Know that I’ve been there, I know what it feels like to shop like a mad woman so everyone has coordinating outfits and pretty hair. It’s ok to let your expectations go and just enjoy the moment. While we’re talking holiday card sessions, just a reminder it is NOT to early to order your cards. All card orders must be placed by December 1st or I make no guarantee they’ll be here in time (New Years cards anyone?). Both of my children have birthdays the week before Christmas, it’s insane enough around here without having to worry I misspelled a name on a holiday card. 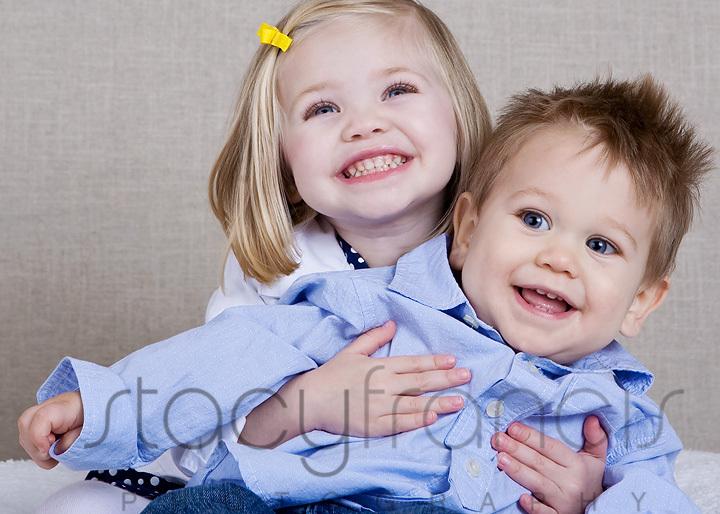 Just to prove my point, two adorable children, not perfect, not looking at the camera, but they’re having fun and enjoying the moment, pretty perfect to me. 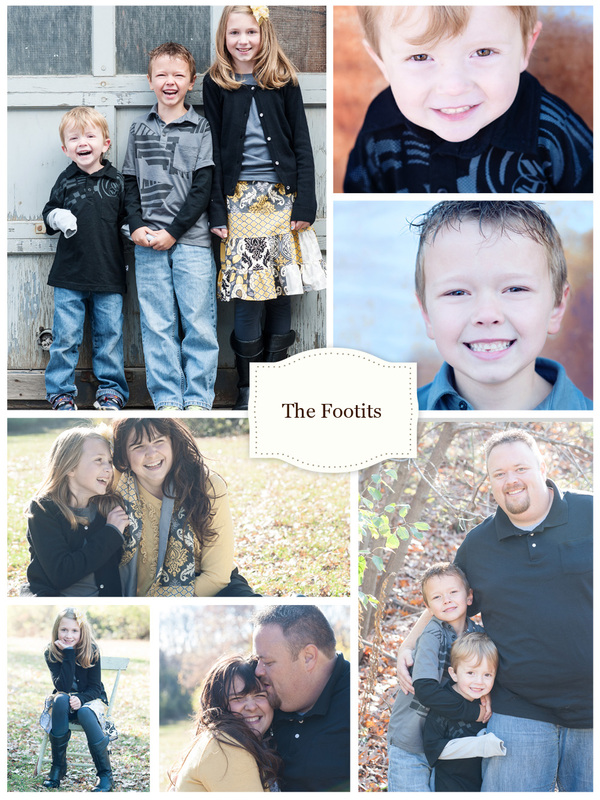 I am SO excited about this years mini sessions! First off I have an amazing friend that offered up her gorgeous tree lined private drive. 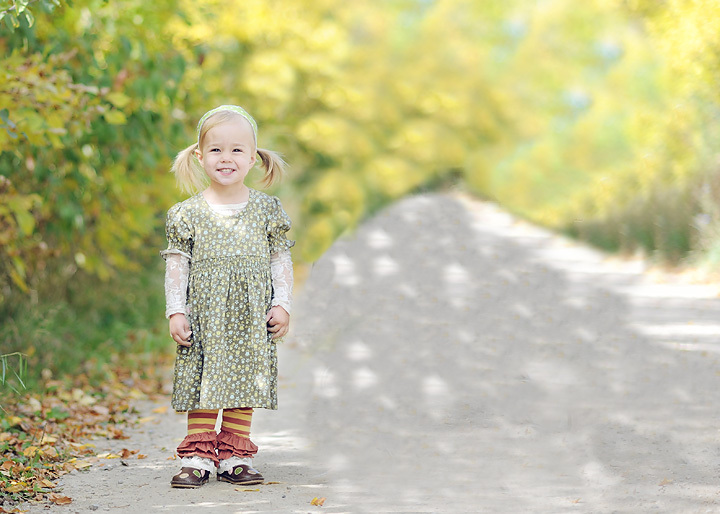 I don’t think anything screams fall more than trees here in Wisconsin and when you can get an entire street of beautiful yellows, reds and oranges as your backdrop you have the perfect setting for a fabulous fall portrait. The second thing I am most excited about is the mini sessions themselves. They will be 20-30 minutes in length, giving you about 15 images to choose from and for the first time ever they will be all digital sessions. You’ve been asking for them and I finally decided this will be the best way to kick off my all new digital sessions (coming soon to the studio!). Your session retainer will include the session and 4 full size digital images of your choice on disk for printing where you choose. A release will be provided as well as suggested labs. These are the perfect sessions for holiday gifts and Christmas cards. This is an amazing deal, digital images are normally $150 each, but with the mini sessions you receive the session and 4 full size digital images for $250, that’s not a misprint, seriously. I kind of want to say “and that’s not all”, but really that is all… oh wait, not it’s not! You will also receive a 20% discount off any print orders you place. Seriously, it doesn’t get better than this. Below are all of the details. There are only 11 sessions available, they will go quickly. To sign up for a session please fill out at the portrait agreement, after you fill out and submit the portrait agreement you will be redirected to the shopping cart where you can easily pay for your session online with a debit or credit card. First you’ll need to register with the shopping cart, then click on “session retainers”, look for the one called Mini-Session Retainer, click on this, add it to your cart and check out.